California Pizza is a symbol of quality and innovation for Pizza lovers. With our Bigger Size and Better Taste, we are proudly serving the Karachi & Lahore. Bahadurabad Branch : Char Minar Chowrangi, Main Bahadurabad, Karachi. DHA Branch : Main Khayaban-e-Shamsheer, Phase-5, DHA, Karachi. Tariq Road Branch : Dolmen Mall (Food Court) Tariq Road, Karachi. Hyderi Branch: Saima Pari Tower, Near 5 Star, Hyderi, North Nazimabad, Karachi. Rashid Minhas Road Branch: Lucky One Mall (Food Court), Rashid Mihas Road, Karachi. Gulshan e Iqbal Branch : Main Rashid Minhas Road, Gulshan-e-Iqbal, Karachi. Garden East Branch: Makia Corner, Near Albela Chowk, Garden East, Karachi. 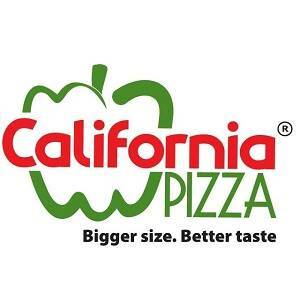 California Pizza Malir BranchMain Model Colony,Jinnah Avenue, Malir,Karachi. California Pizza (Near Disco Bakery): Allama Shaheed Ahmed Usmani Road, Gulshan-e-Iqbal,Karachi. Johar Town Branch: Opposite Shaukat Khanum Hospital, Johar Town, Lahore. Emporium Mall (Food Court): Abdul Haque Road, Johar Town, Lahore. Packages Mall (Food Court): Walton Road, Nishter Town, Lahore. M.M Alam Road: Near Hussain Chowk, Gulberg, Lahore.